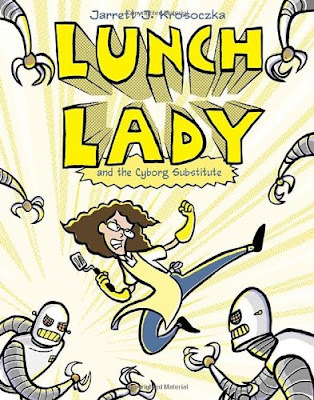 Lunch Lady and the Cyborg Substitute is the first book in the Lunch Lady series. This series is about a lunch lady who is actually a secret agent and her co-agent Betty who helps her make gadgets. There are also three students, known as the Breakfast Bunch, who find out about Lunch Lady's secret life. In this book, one of the Breakfast Bunch's teachers gets sick and there is a substitute. The substitute says that the teacher left them a lot of work to do, but Lunch Lady thinks something is up. With the help of Betty, Lunch Lady has to find out what is wrong with the new substitute! When I first read this book, I really liked it, so I had to get the rest of the books in the series. I really like it because it seems like the Lunch Lady is just a normal lunch lady, but then she starts attacking like a ninja and no one knows she is there. My favorite thing in the book is that Betty creates all these cool gadgets for Lunch Lady to use, like the Spatu-copter.